I created a static multimedia Instructional tutorial using Clarify-it. Clarify-it is a program that builds an instructional tutorial based on screenshots. I use screenshots a lot in my instruction but always just use the the Macintosh interface keys to take screenshots and then bring them into Photoshop if I need to add boxes, text, and arrows. Clarify-it does all this very simply within the program. In building the tutorial, Clarify-it streamlines the whole process. However, getting it here to my blog or to my class website is not so easy or streamlined. 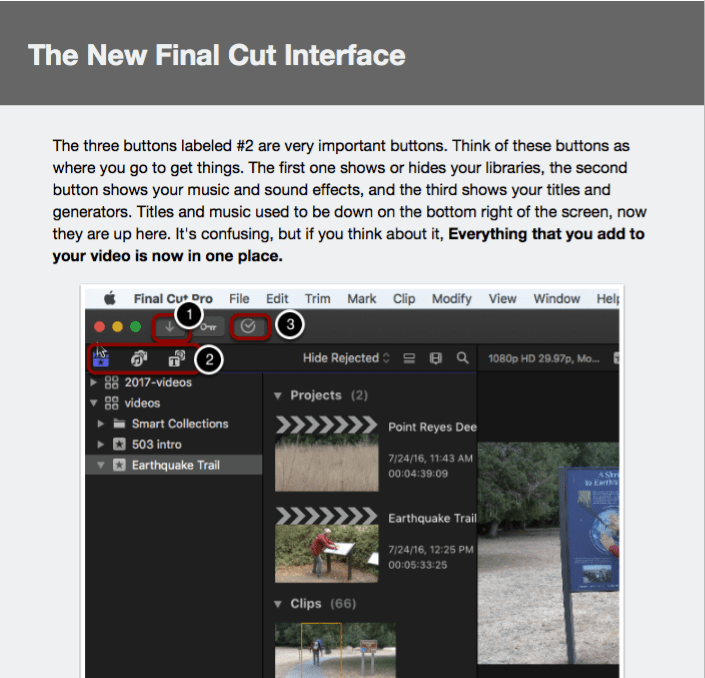 I created this tutorial to show the latest Final Cut Pro interface to my students. I have purposely kept my classroom computers from updating to this version due to the extensive changes in the interface. It looks like a totally different program. When I finally update the program, I will use this tutorial to ease my student’s pain. The Multimedia Principle explains how images and text are better than just text or images alone. This tutorial combines images and text together and is a natural use of the Multimedia Principle because the text is doing the explaining and the images show what the student will be seeing in the interface. The Contiguity Principle states that text should be aligned with graphics, or at least not separated, with text on one part of a page and images on another. The aligning of text with the corresponding graphics helps comprehension and learning. My use of numbers, arrows, and text around the screenshots use this principle while some of the separation between text explanations and images violate this principle. Here is a webpage showing the tutorial hosted on the Clarify-it website. Here is a .pdf of the tutorial. The formatting is not good because the tutorial is separated into pages (like paper). So this version violates contiguity even worse!